May 2016 saw the launch of an appeal for the preservation of the clock at All Saints Oakham. 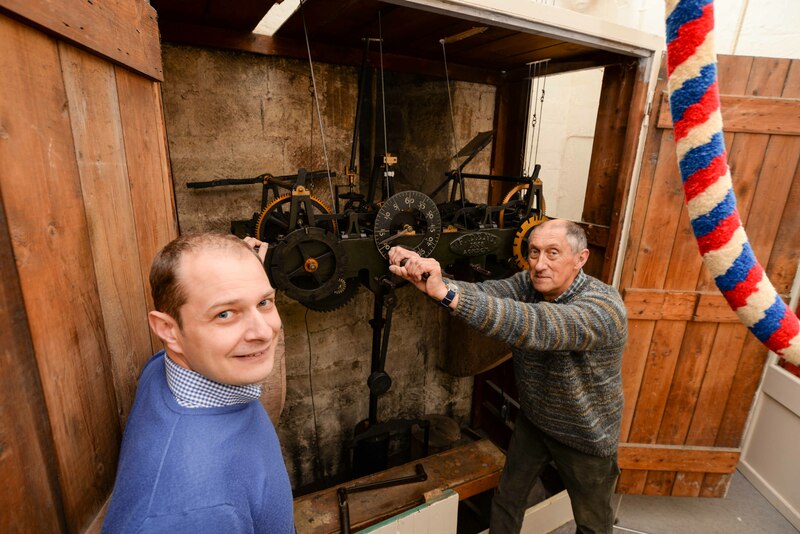 The clock installed at All Saints is regarded as ‘The Rolls Royce’ of movements, primarily because it was made by Frederick Dent, who was regarded as the finest clock maker during the 19th Century in Great Britain for their precision, accuracy and high quality engineering. Unfortunately at 158 years old the clock was starting to show its age. The repetitive nature of hand winding the three heavy train weights every 48 hours to keep the clock running is now putting wear on the movement. From expert inspection we were advised that the clock should have its winding mechanism automated. Whilst the upgrade has removed the function of the three train weights, it has not disturbed the fabric or function of the clock itself and can be easily removed if ever required. To maintain greater accuracy, the new system uses radio technology to synchronise with Greenwich Mean Time (GMT) and adjust the clock accordingly. The new system can also adjust the clock for daylight saving between GMT and British Summertime (BST) as and when required. In case of power failure, the new system has a battery back-up so the clock can continue running for a further 12-24 hours without mains power. The system can disable the quarter and hourly chimes during curfew hours at night and for bell ringing activities.